It's never too soon to begin researching careers for kids. Whether your children know what they want to be or not, there are a number of resources available to help your kids start planning their career path. Helping your child plan for her career is important, but it can become a burden if taken too far. Be careful not to transfer your aspirations onto your child. Do not push too hard. He should still have time and energy to be a kid. As your child grows, his interests will likely change, which means his career interests will likely change too. Don't spend too much time focusing on a specific career until he is a little older and more certain of his goals. Even if he is extremely talented in a given area, it may not be what he wants to do professionally. Don't forget that advances in technology will make some current fields obsolete and future needs will create new opportunities. No matter how old your child is, you can start preparing him for his career. The job market is extremely competitive. The more you can prepare for the future, the bigger advantage he'll have in the job market. The first step in preparing your kids for a career is to determine their interests. What do they like? How do they spend their free time? What is their favorite subject in school? If you have an older child, you can use a career interest or personality inventory to help you focus on a specific career field. There are a number of skills that apply to all careers. He can learn these skills without regard to what he will do in the future. Computer skills: Nearly every field uses computers in some way. Having computer skills will give your child an advantage over someone who doesn't. Conflict resolution: Because people have different ideas and communicate differently, conflict is inevitable. Teach your children to listen to and appreciate other people's ideas. Teach them to compromise. Teamwork: It is better to have a set of ideas than just one. Teach your child to value coworkers' ideas and work with them to achieve a common goal. Work ethic: Explain the importance of work to your child. Teach them to be punctual, ethical and hard-working. Time management and organization: All employers look for employees who can give them the best work in the shortest time. Time management and organizational skills will be invaluable to your children when they enter the workforce. These skills will help them be as effective as possible with the least amount of stress. Once you have a firm grasp on your child's interests, you can research the career options that complement his personality. Kids.gov offers career information for younger kids. Choose your child's grade and then click on careers to see a list of possibilities. Vocational Information Center provides a plethora of information on careers. Some of the resources are geared for adults, but they can be useful for children as well. U.S. Bureau of Labor Statistics links interests to career choices for kids. You can find detailed information about your child's chosen career including what the job is like, the necessary skills, salary, outlook for the job's future and more. The Career Ideas for Kids Series by Diane Lindsey Reeves - See Amazon.com for specific titles. Job shadowing allows a person to spend a day at work with someone who does a job they are interested in. Job shadowing can help your child decide if the career he's interested in is really for him. 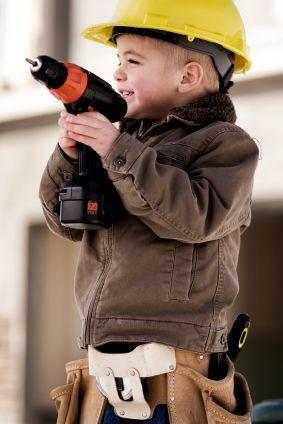 It's never too soon to teach your child the value of work. Use the resources above to help guide him, but leave the final decision up to him. Remember, it may take years before he knows exactly what he wants to be when he grows up.